Scientific Interests: labour market, economics of labour, unemployment, personnel management. 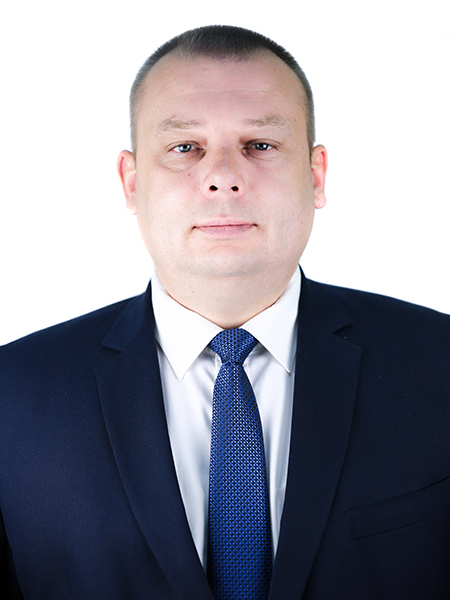 The history of the Faculty of Economics and Management has deep roots, which date back to the origins of the Ternopil National Economic University chronicles. In 1971 the TFEI had three faculties: the Faculty of Accounting and Economics, the Faculty of Finance and the Faculty of Part-time Studies. The second year students of the first two faculties were chosen to form the groups, which started studies at the newly created Faculty of Planned Economy. That faculty became the cornerstone for the Faculty of Economics and Management. In the years since, the Faculty of Economics and Management has opened the door to the world of academic knowledge for many young people. It has created a powerful basis for other faculties, and has become an educational and scientific center, which trains competitive specialists. Today the way the learning process at the Faculty is organized ensures that both teachers and students are interested in getting good results out of joint activities, since the future of the new generation depends on the quality of knowledge. The teaching staff of the Faculty consists of 72 people, including 7 Doctors of Sciences, 8 professors, 64 Candidates of Sciences and 52 associate professors. The best graduates of the faculty have an opportunity to enroll into the post-graduate and doctoral programmes. Ternopil Regional State Administration; Ternopil City Council; State Property Fund of Ukraine; Departments of the Antimonopoly Committee of Ukraine; LLC "Mykulynetskyy Brovar"; national stock insurance company "Askor Ukraine"; JSC "Orion" Ternopil Radio Plant; JSC "Ternopil Ptahkofabryka" (Poultry Factory); PE "West Agro Trade"; LLC "Corporation VATRA". Graduates of the Faculty of Economics and Management may be employed in: joint stock companies; bank; small and medium enterprises; construction companies; joint ventures; consulting companies; investment funds; trade organizations; transport organizations; manufacturing plants; intermediary institutions; state and local governmental bodies; local self-government; standardization, metrology and certification centres; territorial departments of the Antimonopoly Committee of Ukraine; territorial centres of social services; regional state archives; private medical institutions, etc. Students of the Faculty of Economics and Management have the opportunity to study abroad. The teaching staff of the Faculty cooperates closely with universities of Canada, Germany, Poland, France, the US, etc. Students of the Faculty of Economics and Management can study by the programme of two diplomas, which is an effective tool to overcome the dilemma of choosing alternatives – an education in Europe or Ukraine. Students of the Faculty can participate in international language proficiency projects: "Summer School - Ukraine" and "Winter School - Ukraine", organized together with the Wroclaw University of Economics (Poland). Students of the Faculty have an opportunity to practice their English language skills in the native-speakers environment, and to learn about the life in the United States participating in the WORK and TRAVEL programme. In addition, students have the opportunity to undergo military training at the Center of Reserve Officers Preparation and, upon completion, obtain the initial military rank of "Junior Lieutenant in Reserve". The modern ballet group FREEDOM is organized at the Faculty of Economics and Management (artistic director Olesya Sobolyk is a student of the Faculty). Interesting and unusual choreography reveals the interpretations of how the dancers perceive the world. Each dance of the group has its roles and a plot. Dancers express their inner worldview through dance. 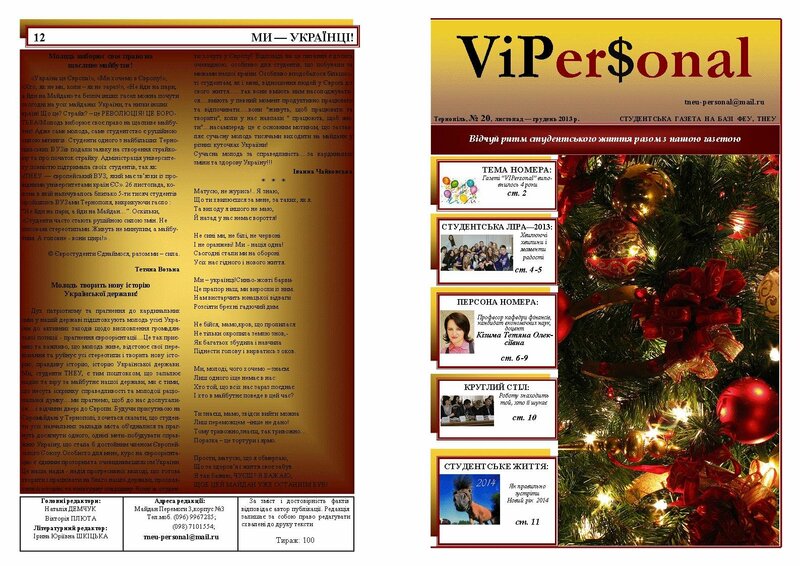 Since September 2010, the Faculty of Economics and Management has been publishing its newspaper ViPersonal, which surprises everyone with its novelty and versatility. Also at the Faculty of Economics and Management, students organize theme nights (movie screenings, various games, football matches, active recreation). Students participate in the "Student Lira" yearly festival of students’ creativity to show their talents, as well as multiple other events. Students of the Faculty of Economics and Management have many opportunities for doing sports. Participation of students in sport and social activities contributes to their harmonious development, strengthening their physical and spiritual health and preparation for their future profession. Scientific and practical research at the Faculty are facilitated by involving students in individual or collective research and public organizational work within their creative and scientific interests. - graduate students’ internship abroad. 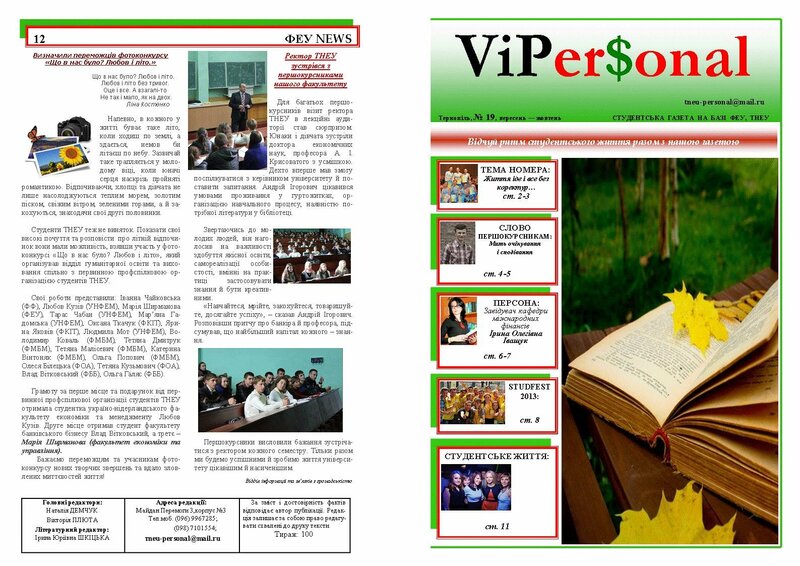 - involvement of foreign lecturers, volunteers of Peace Corps, grant-holders of Fulbright Scholar Program, teachers of partner universities in the educational process. A HOME FOR THE CREATIVE AND DETERMINED!